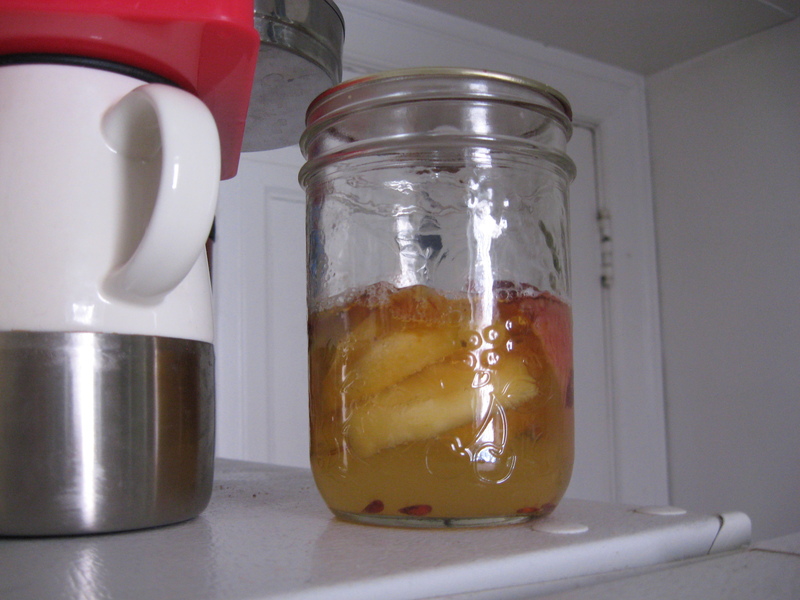 When I saw instructions on Flickr for making Apple Cider Vinegar from apple scraps, it seemed too good to be true. And I said as much. Apparently you can just stick apple cores in a jar with some water and it will magically turn into lovely ACV after a couple of months. 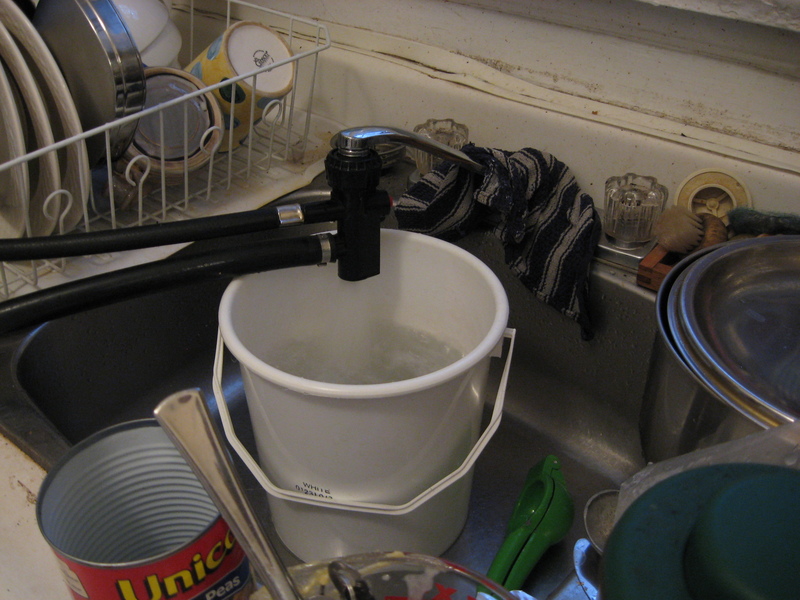 Well, I stuck my cores in water–organic cores, tap water–and now I’m waiting. Every once in awhile I sniff the jar, and PHEW!! it stinks to high heaven! It just smells like mold, disgusting putrid immune-busting mold. It’s been over a week now, and it ain’t getting better. Now, against my better judgement, I’m going to keep this thing around just in case it MAGICALLY transforms into vinegar. Which I doubt. But if it does, I’ll be sure to tell you. According to a friend, we’ve made what constitutes “a typical Costco miscalculation”. The exact size of the miscalculation: 1.8 L. Of Hellmann’s mayonnaise. 100 toasted tomato sandwiches, or . . .
7.5 chocolate cakes, or . . .
30 hair treatments, or . . .
15 each tuna, salmon and egg salads, or . . .
. . . what else? I’ll admit it: I have been making a lot of “Emergency Chocolate Cake” (my own cupcake version with chocolate chips), but this stuff expires in April of this year, and I don’t know if I can make enough cakes by then! So, the question: what would you do with one ton of mayo? Or 1.8 L of the stuff, to be exact. Any ideas I’m missing for fabulous uses for mayo? Urban Foraging, Experiment #2: Black Currants! So I returned under cover of dusk, wearing a green dress so as to blend in with the shrubbery, and spent a good half-hour picking. Oh, the smell! I was in cassis heaven as I plucked the juicy berries from the branches. I brought my treasures home and marched through my little girl’s bedtime routine all the while thinking about the jam I could make with my find. Well, after getting her into bed, and chatting with my mom on the phone I got down to the serious business of microwave jam making . . . at 11 o’clock. First, I found a recipe seemingly from a Four-H club (?) for making small batches of microwave jam. Aha! Perfect. For what I had was the makings of a small batch. I knew that when I started out, even before I had measured my one-and-almost-three-quarters cups of picked berries. The recipe calls for 1 1/2 to 2 cups of cut up fruit, but I was willing to go a little on the lean side. I even included all of the “blemished” fruit, hoping that it wouldn’t spoil the flavour too much. Then I topped and tailed them, and washed them. In the measuring cup full of water, several of the more blemished ones floated to the top. “That can’t be good,” I thought, and took a peek inside. Nope, not good. It was a dried-out stinky worm-bed inside my beautiful berries. There was no denying the fact that they most certainly would spoil the flavour, so I went through them again, discarding any berries sporting what looked remotely like a worm hole. Down to . . . a very respectable 1 cup of washed, sorted, topped and tailed berries. Sigh. So I decided to halve the recipe. “At least I’ll get one jar of jam,” I reassured myself as midnight struck and my dear partner (who had stood by me during the sad, sad culling process) went to bed. So I halved the sugar and added a bit over a tablespoon of lemon juice for good measure, and set about following the instructions. Heat in microwave about 6 minutes, or until boiling–mine took much less time. Stir well, and then cook in microwave 10 to 13 more minutes, stirring every 2-3 minutes. Mine went faster here too, and I was done after about 6 minutes. It says at this point you should chill a spoonful in the fridge for 15 minutes to test the consistency, but I was pretty sure mine was jelling, so I jarred it*. Approximately 2/3 of a one-cup jar of black currant jam. Sigh. Well, what this experiment taught me was respect for two things: 1, the price of high-quality blackcurrant jam, and 2, the value of pesticides. I’m going to bed now, but at least I can look forward to some tasty jam tomorrow morning. * Microwave jam is not processed, so it must be refrigerated immediately and will last for about a month in the fridge. I’ve been reading so much lately about commercial deodorants and antiperspirants: how bad they are for you, how many nasty chemicals they contain, how blocking your sweat glands is actually a bad idea, and how easy it is to delete it from your life. – and somewhere, in someone’s comments feed, I saw that someone, somewhere uses just a dusting of baking soda. So, I’m starting an experiment. This morning in the shower I shaved my arm pits, which was a mistake. Normally I only shave in the evening so that I won’t be applying deodorant to broken skin. So with freshly shaven pits, and a humidex of 28 and long walk ahead of me, I went with the simplest of my diy options and dusted on some baking soda. It’s also the most frugal choice, and the only one I had on hand at the time. And what happened? Well, I’ve been smelling fresh as a daisy the whole day. I re-applied in the mid-afternoon because I was a bit sceptical, but it may not have been necessary. So easy. So cheap. So non-toxic I even let my little daughter try some on herself after she saw me applying and wanted to do it just like mommy. I’ve read in some places that people’s bodies “get used to” their natural options, so I might end up trying Cheaplikeme’s recipe too. Especially seeing as I’ve already bought the cocoanut oil and all. I was going to use up what I have before starting on this experiment, but since this morning’s first foray, I’m going to stick with it and see how it goes. I’ll report back soon but so far I’m optimistic. But don’t worry about bursting my bubble. If you see me and I’m smelling something fierce, please let me know!